Hear Us-Women's March Minnesota-Women's March Minnesota is proud to be a sponsor of this year's March for Immigrant and Refugee Rights. Women's March Minnesota is proud to be a sponsor of this year's March for Immigrant and Refugee Rights. 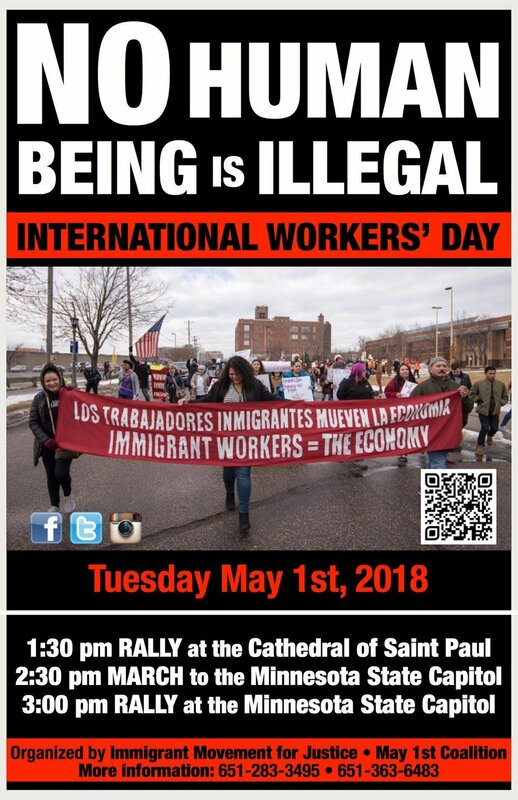 Please join us May 1st as we march in solidarity with Minnesota's Immigrant Community. We march in support of Dreamers and recipients of TPS and DED. We march to demand legalization for all undocumented immigrants. We march to call for an end to unfair deportations of our neighbors and friends. Let's show up in strength on May 1st! Rally at St Paul's Cathedral at 1:30pm. March at the Mn State Capitol at 2:30pm. Rally at the State Capitol at 3pm. Join us when you can! The organizers of this event are Immigrant Movement for Justice, Indigenous Roots Cultural Arts Center, MN-Immigrant Movement-MIM and more. For more information; Facebook page of Immigrant Movement for Justice. There will be a call for marshals for this event going out soon.